Scythebill 13.3 - new "special" reports! UPDATE: Scythebill 13.3.1 and now 13.3.2 have each made improvements to the new Total Ticks code. ORIGINAL POST: Scythebill 13.3 is here! As always, download here, and let me know if you have any problems, either on Google+, Facebook, or by email. 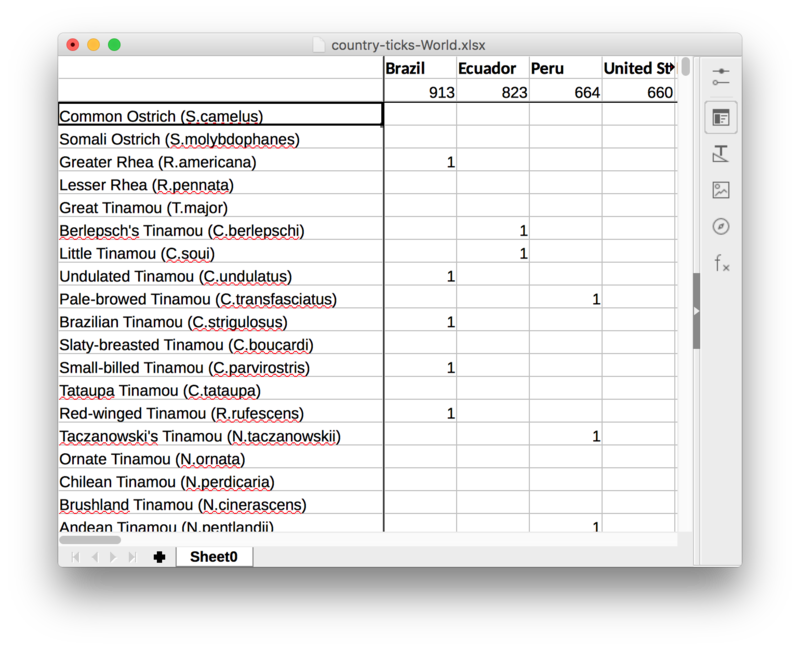 This release adds two new "special reports", easy copy-and-paste from Scythebill species and sighting lists, and more. And, of course, if you want to know what day you saw the most butterflies or mammals, etc. - this all works with extended taxonomies. Compute the list for every state (or province) in the US and Canada (plus Saint Pierre et Miquelon). Add all of those lists together - so if you had 150 in one state, 200 in another, that's 350 total, and so forth. Pretty tedious, huh? So now Scythebill can answer that question for you in a flash. Click the new Special reports button on the main page, then click Total ticks. You'll immediately see your world "country" total ticks list - the sum of each of your individual country lists. And you can quickly switch to "state" or "county" total ticks, and limit to a location - so if you want your ABA state total ticks, that's easy, and if you want your California county total ticks, that's easy too! You can now use "Copy" - or drag - from Scythebill lists (like in Show reports or Browse by species or even the new Big day list) to get the text content into a document or your email. The Print... option in Show reports now includes a more helpful page title describing your report. The Indonesian provinces of Maluku and Nusa Tenggara have been substantially augmented with a number of missing species. The Hawaiian "northwestern islands" (Laysan, Midway, and the like) have been moved to a new "Midway" checklist which is part of the "United States Minor Outlying Islands" (these are not, in fact, administered by the state of Hawaii). However, many Hawaiian listers do include these islands - so there's now a new "Hawaii (with Northwestern Islands)" location available when generating reports. The "world lifer" map was broken if you'd entered any extended taxonomy sightings. The Cut and Copy menu items did not work correctly for taking text out of a Notes field. (The keyboard shortcuts worked fine, but not the menu items). Reports based on "IUCN Redlist" would - amusingly - treat "Rock Pigeon (Feral)" (and other feral and domestic forms) as beyond critically endangered!